Share some holiday cheer, or shall we say, cheers, with a gift from one of North Jersey’s very own. These eight local wineries will help you celebrate the most wonderful time of the year with stocking stuffers, presents for that special person, and, as you might have guessed, some truly “seasonal” wines. Brook Hollow Winery offers fun wine stocking stuffers and stylish décor for everyone on your list, including your office Secret Santa, most under $20. The staff at Four Sister’s Winery is there to help you with a glass of late-harvest apple wine and personalized wine labels with a special message and holiday art. For the savvy shopper, check out the holiday deals offered at Ventimiglia Vineyards: 5% off any two bottles, 10% off any six bottles, and 15% off a case throughout December. Bountiful baskets filled with Terhune Orchards-grown goodies make the perfect gift for someone who has it all. Special apple ornaments are included with a purchase of two or more bottles. Head over to Villa Milagro Vineyards for a south of the border celebration with limited edition Feliz Navidad wine and homemade buῆuelos to enjoy inside a newly renovated tasting room. At Old York Cellars, stop in, sip, and see Santa on December 20-21 from 12-5 p.m. Take home a photo, custom label, and a bottle for someone on your “nice” list. Unionville Vineyards celebrates the holidays with Port – the perfect toast to the season; enjoy four special releases, comprising current and past vintages, available for a limited time. At Beneduce Vineyards, Santa’s coming to town in his very own fire engine on Sunday, December 21 at 5pm; come for pictures and an exclusive tasting of their recently released MANGIONE, a limited production Super Tuscan blend. 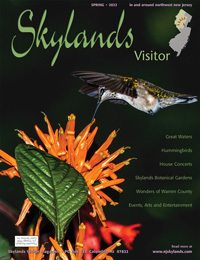 New Jersey’s Skylands Region is known for its captivating landscapes, tranquility, natural beauty and active farmland. Sprinkled with nearly a dozen vineyards, the area is also making its mark as a delightful destination for a diversity of wineries. So no matter in which direction you travel, you’re sure to discover something to please your palate. As an added bonus, those who visit all of the participating wineries will qualify for a chance to win an outdoor adventure, overnight stay, area attraction tickets and more. Drawings are held each December 31st. One of the Garden State’s newest wineries, this venue focuses on offering a large selection of high quality, dry wines. Take an antique tractor-pulled tour of their 10 acre estate vineyard, or cozy up by their outdoor bonfire and sip a glass of wine while you watch the sun set over Hunterdon's hills. Unionville makes wines from five estate vineyards, each having unique soils, slopes and microclimates. The pinnacle of their operation is the Single Vineyard Series, a collection of wines which showcases the different terroirs of the three counties their estate plantings cover. Unionville has won back-to-back Governor's Cup awards; Best Overall in '12 and Best Dessert in '13. Be sure to set aside time this fall for a leisurely drive through the North Jersey Wine Trail countryside. Sip a glass of vino and enjoy the view. No exits, no noise. Just tranquil countryside and delicious wines. It's all about the experience! Come enjoy! Check our farm destinations map for winery locations. The North Jersey Wine Trail is supported in part by a grant from New Jersey Department of State, Division of Travel and Tourism For more information on each winery, please visit Vintage North Jersey.